Beautiful, comfortable, well-equipped, steps to beach!! Naples Florida vacation condo for rent on Vanderbilt Beach with views of bay. Walk to beach! Condo is well maintained and lovely. Your vacation rental on Vanderbilt Beach features wonderful views down the channel. Watch the boats, wildlife and dolphins. You are steps away from the beach, water activities, grocery, shopping, dining, and Delnor-Wiggins State Recreation Area. This is a great location and a beautiful place! The condo is nicely decorated, well maintained and comfortable. There are plenty of towels and all you will need for a pleasant stay. There is a computer and internet access. Southwest Florida is a tropical paradise. Warm breezes and dazzling sunsets await you. Enjoy sensational shopping, wonderful restaurants, cultural events, spectacular fishing, and recreation sites, as well as golf courses - many designed by PGA pros. I am consultant with over thirty years of experience. My husband is an owner of a small business and an industry consultant. We just celebrated our 32th wedding anniversary. We have three daughters, four granddaughters and one grandson. 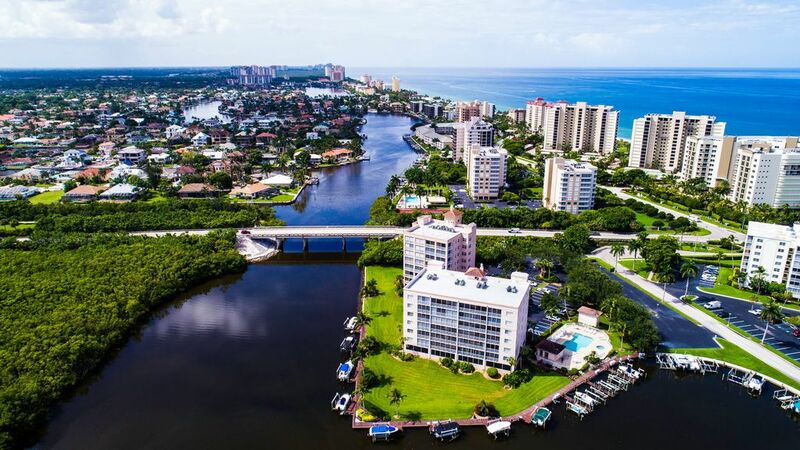 We love the Naples area and all it has to offer. I love this location. You get to watch the boats and occasional dolphin passing in the Vanderbilt Channel and simply cross the street to reach the beach. There is a lovely view. Watch the boats come in and out. Look for fish jumping, dolphins and manatee. Beach towels are also provided. The condo is wireless. Take your laptop to the lanai. Lovely condo with view of Vanderbilt channel and directly across the street from Vanderbilt beach. Nicely decorated, clean and well-equipped. Spices are available. I have an honor system. Just replace something if you use the last of it. This includes spices, oils and marinades. Kitchen dining for six and dining room for six. Feel free to take or leave a book. We have DVD's and videos for guests to view.